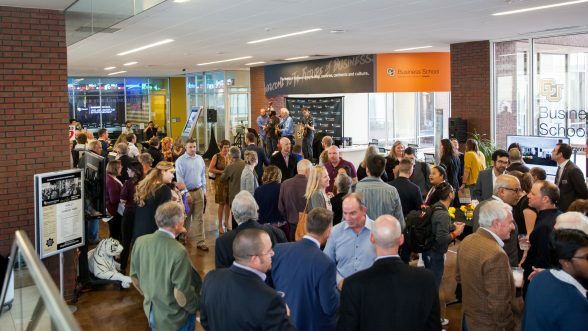 On October 2nd, a lively crowd – consisting of community members and CU Denver leadership, faculty, staff, and students – cheered on the CU Denver Business School and the Jake Jabs Center for Entrepreneurship as they broke ground on the soon-to-come Jake Jabs Event Center. Jabs donated $12 million in 2013 to the Business School, and the formerly known Bard Center for Entrepreneurship was renamed in his honor. Six million of Jabs’ gift is funding the new Event Center, which is part of an overall $11 million development project to revamp the current Business School building. The new building, set to open in spring 2020, will include the multi-functional Event Center, a headquarters for the Jake Jabs Center for Entrepreneurship and several auditorium and classroom spaces. For more information regarding the new building and its amenities, click here. 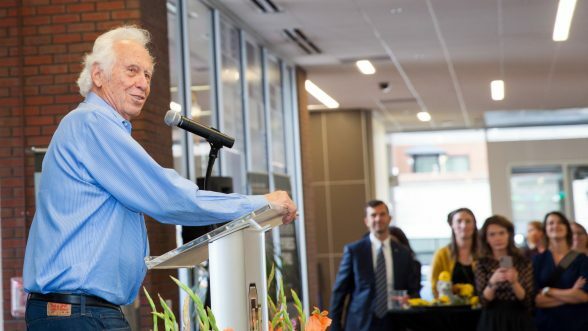 The other $6 million provides continued support for academic programming, student scholarships, research and more at the Jake Jabs Center for Entrepreneurship. More than 140 attendees came to celebrate the new Jake Jabs Event Center – coming spring 2020.
Business School Dean Rohan Christie-David emcee’d the event, and separately introduced University of Colorado System President Benson, Chancellor Horrell and Jake Jabs Center Director Madhavan Parthasarthy to the stage. Each shared heartfelt stories of their friendship with Jabs and how much his donation means to future of the university and Business School. American Furniture Founder & CEO Jake Jabs addresses the crowd.